One of the most ancient epics of India, the Mahabharata is recreated and brought to life in the pages of the trilogy, The Aryavarta Chronicles. The first two books — Govinda and Kaurava — were gripping works that told us how kingdoms rose and fell due to various factors. 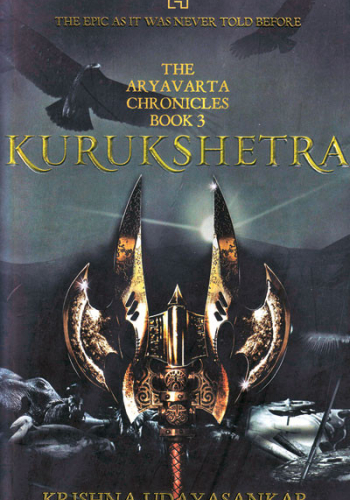 The final book in the trilogy, Kurukshetra, revolves around the fall of the Aryavarta Empire and how a battle for power sees the rulers engaging in devious moves and killings. Amidst all that is Govinda Shauri, who is faced by decisions and choices which will result in the fall or rise of humanity. Read it for an imaginative take on mythological worlds and for its elements of mystery. Three grandchildren, all from different parts of the world and holding different fears in their hearts, travel to Gangtok in celebration of their grandmother Chitralekha Nepauney’s 84th birthday — the Chaurasi being an important milestone for Nepalis. But what is a party without someone making it difficult to be there? Emphasising on the changing interpersonal relationships in the family, politics of their hometown and more, Land Where I Flee makes for a pleasant read. The author, who grew up in the north-eastern state, gives the readers an essence of what it would be like to have lived in the dominantly Nepali-speaking region. “The dark legacies of Partition have cast a long shadow on the lives of the people of India, Pakistan and Bangladesh” — these lines on the inner flap of the book could not ring truer. Fresh from an experience of post-partition drama from halfway around the world, the book’s editor Urvashi Butalia compiles essays that dig deeper into the consequences of the Partition of India. From resettlement, forcible eviction and massacre to the other unspoken attributes like literature, culture, art and what it means to fit in (such as events from the six-year-long Assam agitation), this book carries in words many experiences, and talks about issues including the division of the north-eastern region and the winter wonderland of Ladakh. With essays by scholars, journalists and even those personally affected by the landmark event, this volume is surely a good pick. Don’t skip the chapter A Good Education — a graphic short story (illustrated by Vishwajyoti Ghosh, and written by Bengali novelist Amiya Sen) on experiences in a refugee camp. Definitely not for the faint-hearted, Partition: The Long Shadow would surely appeal to fans of literature rooted in history.